This was my first time attending Made South. Made South hosts events that showcase local and regional growers and makers in the South. This fits into my esthetic of supporting local and sustainable farming and makers. There were so many talented makers and growers here, and there were some products that I was surprised and happy to see. There were hand crafted leather makers, there was a really nice hunting accessory maker, there was a cookie maker, jewelry makers, tea makers (yes, there is an art to making good Southern ice tea), rice growers, peanut butter maker, and to my happy surprise an olive oil producer who lives in Franklin, TN. There were so many cool attending vendors, that I will have to see them again in November. During my visit to Made South last week, I got a chance to talk to three of the local makers and hear a little of each of their stories. 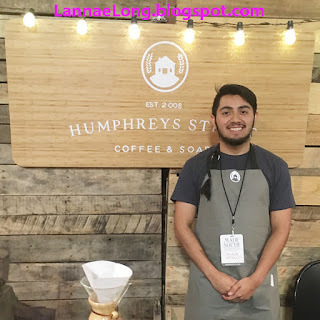 I did not know about Humphreys Street Coffee and Soap, located at 155 B Old Hermitage Ave, Nashville, TN, until I went to this Made South. 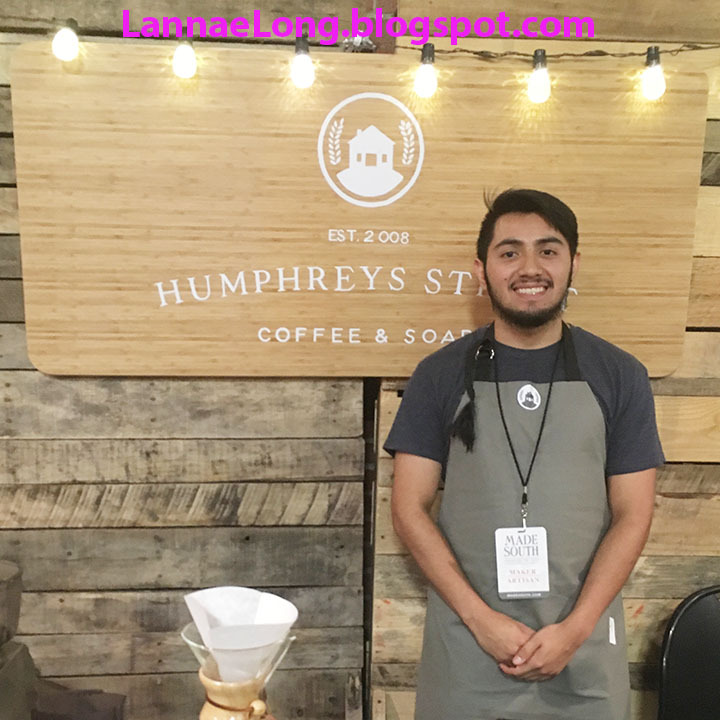 Humphreys Street Coffee and Soap, a non-profit, opened its doors 10 years ago at a short 1/2-mile from our new Music City Convention Center. Humphreys Street is located in the Napier Community of Nashville, a work class part of town. Humphreys Street is open to neighborhood kids to come and learn how to procure, roast and sell whole coffee bean, and how to make artisan soap in the traditional way. Humpreys Streets helps kids learn a craft, makes some money, focus, and go on to do great things. One of the recent students to learn how to roast coffee, now has a summer job roasting coffee at local coffee shop, and he is getting ready to attend David Lipscomb University this fall, and he is studying computer science. I like the soaps a lot because they are traditional fat and lye soap with essential oils. The soap base is coconut and other oils and cured with sodium hydroxide (lye, a salt). I know I can eat coconut oil, and I can eat sodium, and I feel good about putting these things on my body when I wash may face, and take a shower. I have been have some skin allergy reactions lately, and it is helpful to have soap with ingredients I know will not cause an allergic reaction. The soap is just lovely. If you need some coffee beans, and some traditional soap, consider getting some Humphreys Street Coffee and Soap. The store front at 155B Old Hermitage Ave, Nashville, TN is open weekdays from 9-5 (summer hours) and you can always order online at Humphreys Street website. I run around with some friends who think it is important to know where your food comes from and to know your farmer. Way back when, over a decade ago, it was May, I did a local food challenge, when I spent a week eating food raised within 100 miles of my home. I still mostly eat this way today, with most of my food coming from within 100 miles of my house, and much of it is organic, biodynamic or grown under organic practices. I allowed myself a few exceptions, salt, coffee and rice. It was so easy to find dairy, eggs, meat, veggies, and some limited fruit, but there are no coffee plantations or rice fields within 100 miles of my house. Most of the rice I eat is from Thailand, but all this is changing. Before last week, I did not know any farmer growing rice, BUT not far from Nashville, is the Mississippi Delta, the perfect growing land for rice. At Made South I met David and Rebekkah Arant from Delta Blues Rice, rice farmers in the Mississippi Delta. They had a sample of the brown rice grits for me to try. It was terrific and I bought a couple pounds right away. I love grits! I am testing whether I am allergic to corn or not, and if I am, I must give up corn, corn products, grits, popcorn, corn starch, corn syrup, corn. The brown rice grits were delicious, had a nice texture, and are a good substitute for corn grits. Now all I need is a good substitute for popcorn. Anyone? Popcorn Substitute? Anyway, Delta Blues Rice brown rice grits can be cooked to be a little nutty in texture, or really creamy, just like corn grits. Delta Blues Rice is grown under organic practices, and David is in the process of getting Organic Certified. 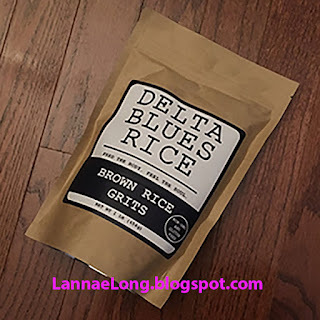 Delta Blues Rice is available at some retail locations in West Tennessee, and in 17 other states right now, and Delta Blues Rice is also available online. As I looked at David and Rebekkah, they are an adorable couple, I almost didn't believe that they were farmers. Farming is hard work. I mean, I take care of my 6x6 organic veggie bed and it is about all I can do to be a grower right now, and it is a lot of work. I get most of my veggies from the Barefoot Farmer, one of the longest running biodynamic farms in the USA (about 40 years). Jeff and all his folks are over worked, WAY UNDER PAID, and it takes a lot of time and energy to produce the majority of the veggies I eat, as well as the rest of the CSA population. Cocky as I was, I told David to show me his hands, because I almost didn't believe he was a farmer. And there it was, the palms of his hands, his fingers, the texture and wear on his skin, his hands told the story of the hard labor he does on a daily basis. I asked him how he got into the farming biz, it is not something most people gravitate to after college. He said he went to college in MS (not Ol' Miss, that other one in the State of MS), and became an civil engineer. His wife and he moved to the capital of MS (let's play the geography game, what is the capital of MS? ), he worked as a professionally licensed engineer, and was not living his authentic life for him or his family. David's authentic life is being a farmer. So, David and Rebekkah pack up their kids, and drive out of the city and into the Mississippi Delta to become rice farmers. As an engineer myself, I look at David, knowing he gave up a steady life of as an engineer, a "good" life where him and his family would be able to have all the comforts of a solid life in middle America. Rebekkah and he had the courage to gave up a steady "good" life to be a farmer, which is a hard working life, but a real life and a real good life for them. And I met Craig of Syp Coffee. I stood there for a long time looking at his product. And then it wasn't so busy, so I got to talk to him a little. Craig has a few coffee growing farmers he sources from, and he has been to all the farms (except one, but that biz trip is up and coming). If you really want to know what you are eating, it is important to know your farmers, know where your food comes from, know how your food is grown, and know what your farmer has to do to get your food to you. It is important to fairly treat and purchase from your farmers. The coffee is as fair and equitable as you are going to find in Middle TN. 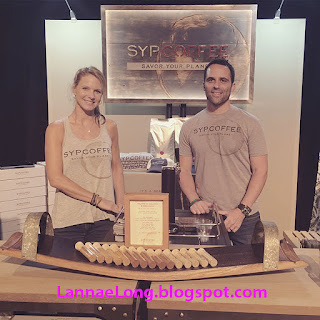 You can buy Syp Coffee in the Nashville area at Batch, Savory Spice and All Things Co and you can always go online at Syp Coffee. For those in and around the Franklin, TN area, same day shipping is come soon (and possibly less than 2-hr delivery!) because Syp Coffee just got its own Syp-mobile to deliver to you some fine coffee. As I talked to Craig, I found out he moved here with his company, one of the largest auto makers in the world that made Nashville it's North American headquarters. He was going along with his corporate job, living a life that some may envy with great cars, great house, great food, great travel, and more. Then both of his parents passed away, and it made him reflect upon his life and what really matters, who he cares about, how he shows his love to his loved ones, and what he was doing with his life. Craig had an idea about Syp, and life is short, so he quit that corporate job and started Syp. The motto for Syp is "It is a beautiful thing, this life, and it moves quickly, which is way you deserve to savor every moment fully and completely." Craig has beautifully crafted gift boxes, they are wood boxes, with a hand written card from him in every box. 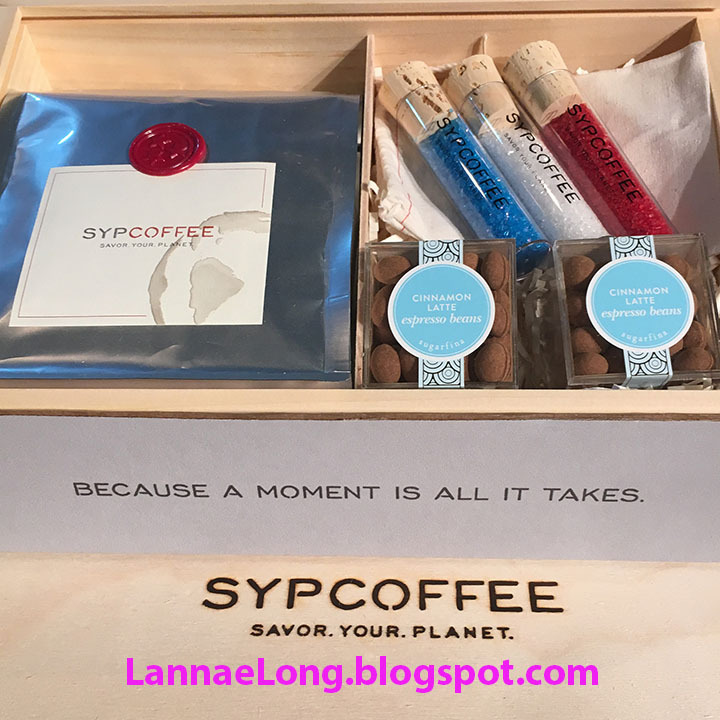 He wants recipients to feel the love and care that went into the gift givers decision to send this coffee package (instead of flowers, or with flowers!) and to feel the quality and integrity of the gift. He hopes that when the coffee is brewed and ready to drink, the recipient will take a moment for themselves, reflect on the beauty of life, reflect on their loved ones, think about the love around them, and enjoy the flavor, texture and aroma of each sip. Everything that went into that cup of coffee was made with care, from the coffee bean grower, the box maker, the sugar maker, the candy maker, and Craig for bringing all these craft and artisan people together to create this product, Syp Coffee. 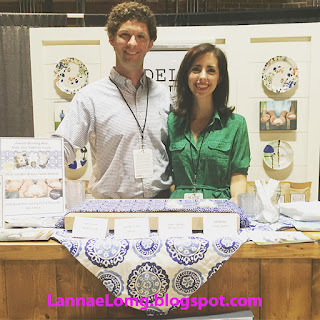 I really enjoyed meeting these three vendors at Made South. They all have come to a point in their life, and what they do to bring meaning to their lives, as well as our lives. I sense their courage for what they are doing. I feel their authenticity. They are all inspiring to me. Just in case you need a hint, the capital city is Jackson, Mississippi.